Across the country, literacy, especially in grades K-3, is a priority in just about every district you visit. 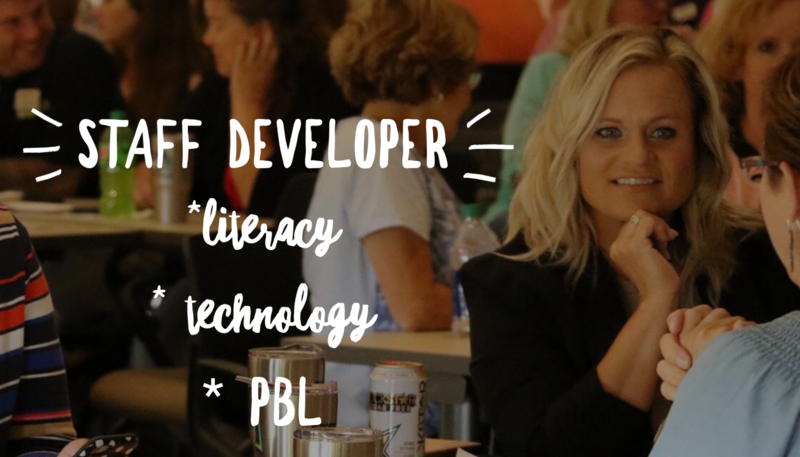 Educators are banding together to share best practices, evidence-based interventions, and inspiring stories; all in an effort to impact student literacy. All learning in rooted in language, and as one progresses throughout life, access to continued learning, both personal and professional, is typically accessed through written communication. For me, literacy is my passion, and I have dedicated my life to reading, researching, and sharing not only how to develop young students into lifelong readers, but to advocate for high-quality instruction in literacy for ALL students. Being literate not only allows access to information, but influences one’s personal, professional, and civic lives. Upon graduation, my wish was for students to be equipped with passion and skills to be critical discerners of information, make informed decisions for the betterment of society, and be able to advocate for self and others. To be able to do these things, a solid literacy foundation must be formed in the early grades. Educators learn about their young readers in a variety of ways when they enter their classrooms. Understanding what they enjoy reading and learning about, how they choose books, which foundational skills they have acquired as opposed to which ones they still need to practice or learn. Typically, in a K-3 classroom, teachers administers some sort of fluency test with accompanying comprehension questions. These assessments provide an abundance of information on students to inform instruction. The drawback to this type of testing is the large amount of TIME it takes to test individual students with classrooms of 25+ young readers. And we all know the one thing teachers need is…More TIME. That is why I was ecstatic to preview a new assessment tool launched by NWEA called MAP Reading Fluency. I want to stress, NOTHING takes the place of an Expert Teacher, but when resources like this become available and save teachers time to then reclaim and use for instruction, it is a WIN – WIN for kids. MAP Reading Fluency is the first and only K-3 oral reading assessment using speech recognition, automatic scoring and computer adaptive technology. It allows data to be collected around; oral reading fluency, comprehension, and foundational reading skills. With this information, teachers are able to make decisions on which areas they may need to dig in a bit deeper in order to differentiate instruction and meet needs of students. I am also a firm believer in two things when it comes to assessment and data. First, MAP Reading Fluency provides a snapshot of the student as a reader; multiple snapshots across time allow teachers to notice trends and trends should be noted and investigated to find out the What/Why. Second, assessment data does not paint the whole picture of a child as a reader. This is where the beauty of computer-aided assessment comes into play. Reading Fluency data that is generated is immediate, organized, disaggregated and actionable. This is a huge win for teachers and a time-saver due in part to the streamlined process of technology. The follow-up, the instruction, and the passionate teaching to the student is then provided by the Expert Teacher. For the past 5 years or so, I have been investigating tools and resources that would support teachers and students in this exact way; it is as if NWEA read my mind and delivered with Reading Fluency. MAP Reading Fluency was named the 2018 CODiE award winner for Best Student Assessment Solution. It is adaptive to accommodate pre-, early-, and fluent readers, and is recorded so that teachers can listen to their students during a planning time or while working with their PLC. I am excited about the possibilities of this new assessment tool and appreciate how it aims to shorten the time spent assessing so more time can be spent on instructing! Want to learn more? Check out this FAQ sheet or request a Demo of MAP Reading Fluency. On any given night, you can find my children (grades 5 & 9) along with millions of others, playing video games. From Fortnite, to Minecraft, to Roblox; many hours are logged in these virtual spaces playing… and also learning. The learning taking place is not necessarily organized by specific disciplines but instead, a collective intelligence which blends content knowledge, creative problem solving, design thinking, along with collaborating and communicating with peers around the globe. As educators, the goal is not for everyone to use video games in the classroom, but instead, understand the features of Affinity Spaces and work towards creating similar conditions in our classroom. Organized around a common passion – A common passion, not race, gender, or socioeconomics, is primary and respected by all in the space. Common space shared by all (Newbies, Veterans, Masters, etc.) – Everyone is accommodated in the same space. Newbies are not segregated from those that are considered masters of the game. Everyone can consume and create – Affinity spaces allow everyone to consume not only game-based creations but those created by players in the space. Consuming and creating are encouraged to allow everyone to build if they choose to. Content is transformed through interaction – The content is not fixed and constantly is transformed through interaction. Development and pooled broad, general knowledge as well as specialists – People are enabled to create and share knowledge and skill within the space. Individual and distributed knowledge encouraged – People are enabled to gain individual knowledge and share and spread specialized knowledge. Use of dispersed knowledge is encouraged (hacking and smashing to gain the desired product) The use of onsite and outside resources and tools is encouraged and supported to gain the creations people seek. Tacit knowledge is used and honored – Affinity spaces support people to learn by doing rather than memorizing tutorials or reading lengthy directions. Many different ways to participate – Participation in the space is varied and on multiple levels. Multiple ways to gain status – People can gain status, if they want to, in many different ways. Leadership is porous and leaders are resources – There are no bosses. People can be both leaders and followers. Roles are reciprocal – People sometimes lead, sometimes follow; mentor or be mentored; ask questions or answer them. The bottom line is there is always more to learn. Learning is individually proactive -Affinity spaces view failure as a means to success. Help is available, but individuals are still responsible for own learning. Encouragement from audience and feedback from peers – Feedback is welcomed from others interacting with your creations, while peers play an important role in providing critical advice to move individuals forward. While all of these features are not required, an Affinity Space has most of these features. And upon reflection, most of the popular video games that our students play have these features. That is why we have students, and in my case children, who play hours on end. I, too, see some of these features in the spaces I spend my time as an educator. It is time to pay attention to attributes that make this type of learning successful for students and ask ourselves how these features can be reimagined in our own classrooms. Education is not merely producing consumers but those that can create and produce for the betterment of their space. Source: Gee, James Paul. Literacy and Education. New York: Routledge, 2015. Is listening to an Audiobooks the same as reading a book? Is it cheating or lazy to listen to instead of actually reading it? Do audiobooks help to develop readers or hurt their development? All of these questions were unearthed during a conversation I had with a fellow educator whose daughter was listening to books at home instead of reading them. The simple answer is YES, audiobooks are similar to reading and have benefits to the listener. Some date the origins of audiobooks to that of oral storytelling and how stories were passed down through generations before a written language and the act of reading was mainstream for the common person. In education, I was surprised to see the amount of research done around this area and found most agree that similar skills are used and when you consider the goal of reading, listening to an audiobook does count as reading. The goal of reading is not to decode words and be able to pronounce them but to comprehend and think critically about what you read. Independence – A student’s oral vocabulary far outreaches their reading abilities. When one accesses an audiobook, it promotes independence. It also is a great way to differentiate content in the classroom! Access to Information – Audiobooks, and listening to text, provides access to those students who wouldn’t be able to read the text independently. When teachers deny students access to information based on their reading level they are promoting a division of inequity. There are many reasons why students struggle to read, but just because they can not decode specific words on a page does not mean that they also struggle to think and understand. Reading level does not equal intelligence, but limiting access to information because of it harms students. Broadens one’s world, locales, accents, dialects, cultures – Stories have the ability to transport readers to different places, experience different cultures, and identify with others who are similar. Developing empathy and awareness can be achieved through audiobooks, with the bonus of hearing different accents and dialects. Linguistically Rich – Promotes Storytelling – Audiobooks promote storytelling. Students listen to a linguistically rich text and are inspired to talk about their book by connecting it to their own experiences or other things they have read or viewed. The more stories one collects, the more language they acquire to share their own voice. Increases: Motivation, Background Info. Content Knowledge, Vocabulary – Listening to audiobooks has been shown to increase motivation in reading which is an essential element for struggling adolescent readers. Research also shows audiobooks help to increase background information and content knowledge and is especially beneficial to our EL (English Learners) students. Models Good Reading – Audiobooks, similar to read aloud, models good reading to students. Hearing an expert reader adds experience to all growing readers. Improves: Critical Listening Skills, Reading Accuracy, Fluency – Audiobooks not only promote critical listening skills, an essential life skill but also help student reading accuracy and fluency. Fluency is so much more than reading fast. Audiobooks allow students to not only see words pronounced correctly but hear and notice pronunciation, rate, speed, pausing, stress, and intonation. Check your local and school library.